There are several approaches to finding the least expensive shoes for your wedding. You can monitor local department and bridal store sales, but the largest selection — by far — is online. Shoe store Websites often permanently discount shoes or sell extremely cheap wedding shoes in special clearance “aisles.” It is also easier to find discontinued designer shoes at closeout prices over the Internet than locally. For more tips on finding cheap bridal shoes, visit the MyOnlineWeddingHelp.com discount wedding shoes page. 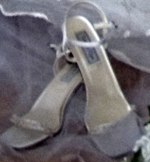 To check for online shoe store coupons, sales, and discount codes, take a look at our new Bridal Shoes Coupons page.